For those unfamiliar with his work, Haroon Mirza is a British sound artist who creates site-specific sound installations using domestic materials, found items and electrical equipment to produce these compositions. Mirza won the Northern Art Prize in 2010 and has been awarded a commission for this year’s Frieze Sounds. In other words, he is headed for stardom in the art world. As such, expectations for his latest untitled exhibition at Lisson Gallery were high. The first piece upon entry, Sitting in a Chamber is a quintet of turntables that have been modified. One spins with a splintered shard of wood attached to it, puncturing the stark beam of a positioned light bulb. 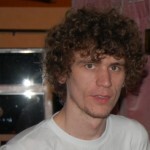 Mirza has remixed the original vehicle of the remix. 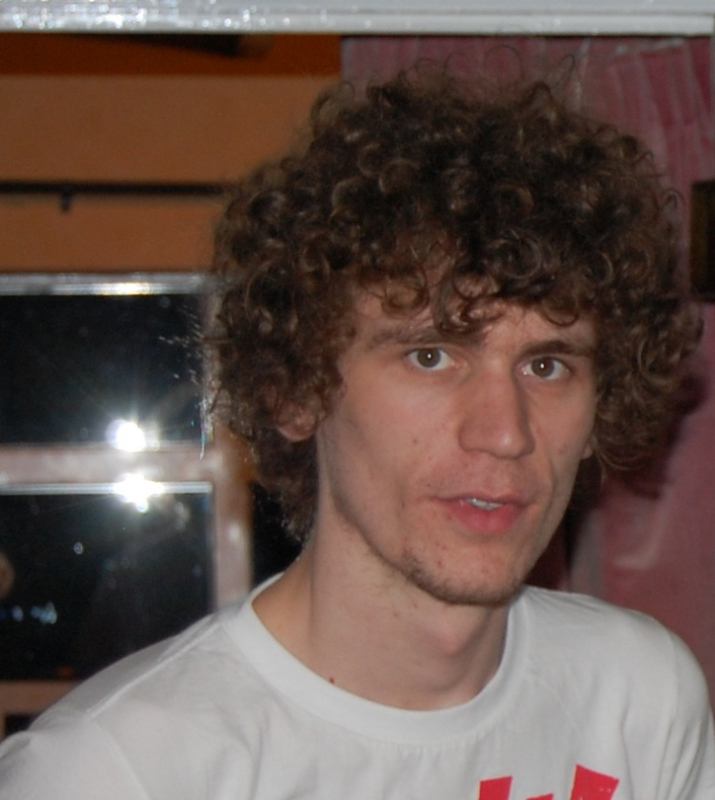 The aesthetic is second-hand, lo-fi, but strangely elegant, which is typical of Mirza’s work. The pounding syncopated rhythms emanating from the piece are like air-raid sirens driven along by a war drum: it feels like the music you might find at a post-apocalyptic rave. Mirza’s practice appreciates these analogue instruments not just for their aural qualities, but also their design and how they interact with the space. This observation is particularly true for Adam, Eve, others and a UFO, which is brilliant for its understated simplicity. 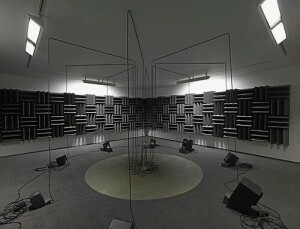 The piece is merely an octagonal circuit board surrounded by eight speakers, with the adjoining wires strung up on the ceiling. Yet, combined with the mesmeric, hypnotic analogue composition it produces, the work manages to transform the boxy space of a small room into the lair of some sort of cyborg octopus. Despite their analogue nature, Mirza’s pieces are somehow robotic and apparently autonomous, but on closer inspection they are in fact strictly controlled. LEDs attached to the circuit board conduct the composition by indicating which speaker is playing, again a simple but extremely effective idea. The piece is a particularly pertinent demonstration of Mirza’s architectural skills, immersing the audience in a completely reconfigured space. 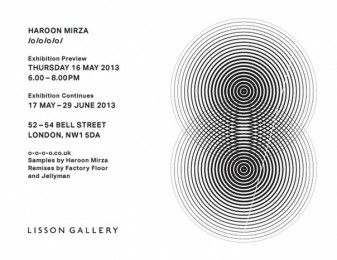 Truly a pioneer in the world of sound art, Mirza is at the top of his game, hence the high expectations of this exhibit. Although the pieces displayed are no doubt accomplished works, typical of the artist’s combination of sound, sculpture, architecture and composition, you can’t help but feel they do not quite meet his innovative capacity. There’s still enough that is of interest for this exhibition to be a worthwhile visit for both new and old fans. 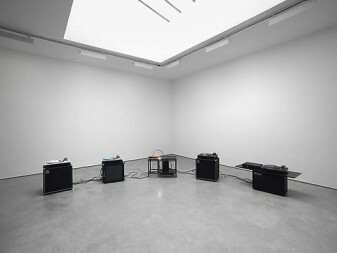 Haroon Mirza: O/O/O/O is on at the Lisson Gallery until 29th June 2013, for further information visit here. 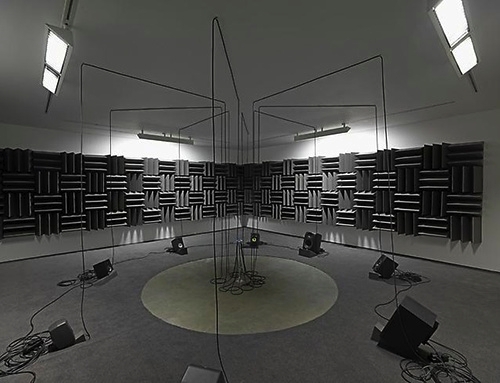 For further information about Haroon Mirza visit here.